I keep this pouch on the back of my belt, behind the last magazine pouch, fully open. Great to drop in the live round and magazine that were unloaded at the end of a stage, as well as to keep all the (almost) empty magazines picked up from the course. This way there is no possibility of confusion between full and used magazines. A good item to have when on range or away, it folds down to a small and compact size. It comes with a belt loop, ideal when on holiday. I will be using mine in the Isle of Man at the end of this month. Its big enough to hold a can of drink and food or for holding your empty brass. The uses of the CED Universal Pouch are as broad as one’s imagination! The ultimate brass collection bag, a convenient shotgun shell carrier, an excellent M4, M16, & pistol magazine bag. Perfect for afternoon errands, or to hold a packed lunch and water bottle, and ideal as a multi-purpose utility pouch. 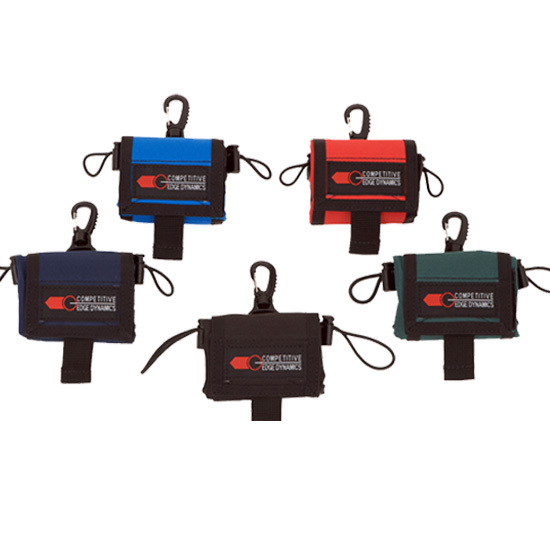 The CED Universal Pouch can be worn on the belt in a folded position, measuring a mere 2.75" x .53" x 2", saving precious belt space. It has snag-free elastic shock cord closures that pull from the backside of the bag. A Velcro flap, which retains the pouch in its folded position, also doubles as a lid or can be concealed completely within the bag. 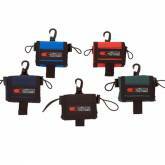 A top heavy-duty swivel buckle allows the CED Universal Pouch to be attached to a Range Bag, Back Pack or any bag desired. The mesh bottom allows for quick drainage of water, sand, dirt, or other debris. * Total Volume: 190 cu. in. * Empty Weight: 0.3 lbs.